Rabbits may be cute in cartoons and nature programs, but they're anything but when they invade your garden. While no plant is 100 percent rabbit proof, there are a number of flowers that rabbit generally wont eat. As a general rule of thumb, plants with textured leaves or flowers, heavy fragrance or thick sap will be avoided. 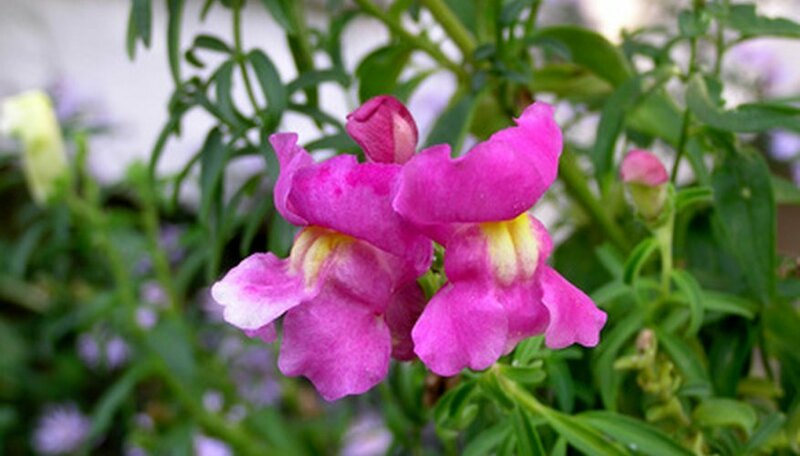 A member of the figwort family, snapdragon (Antirrhinum majus) is a tender perennial native to North Africa and parts of Spain and the Mediterranean. Snapdragons are not a rabbit favorite, and will usually be avoided. The fast-growing plant sports lush green foliage and tall flower stalks with blooms ranging in color from pink to purple or even bicolored yellow and red. Snapdragons are fairly low maintenance, and will grow best in full sunlight in USDA zones 4 to 11. A well-drained, rich soil is ideal for this plant. Snapdragons should be watered frequently when first planted, and watered regularly after the first few weeks. Deadheading the plant's spent blooms will prolong the blooming period and help keep the plant looking fresh. Aster (Aster spp.) is a perennial native to North America that boasts fuzzy summer blooms in a range of colors, from classic lavender to pink or white. The attractive plant, which also sports bushy blue green foliage, is a favorite of gardeners, but generally not enjoyed by rabbits. Aster does best in full sunlight in USDA zones 4b to 9a. Aster isn't picky about soil, and will grow in alkaline, acidic or neutral soils as long as they're well draining. The plant has some salt tolerance, making it a good choice for coastal gardens that have a rabbit problem. Another member of the figwort family is the foxglove (Digitalis purpurea), a short-lived perennial native to Western Europe. The plant has a vertical, upright habit, making it a good choice for borders. Foxglove sports rows of speckled tubular flowers in a range of colors. The flowers of the plant are highly attractive to bees and hummingbirds, which will flock to the garden to visit the plant. Foxglove does best in partial shade in USDA zones 4 to 9, in a well draining, heavily acidic soil that is kept moist. Strawberry foxglove (Digitalis mertonensis) is hardy to even cooler climates, thriving in USDA zone 3. Foxglove is poisonous if ingested, and is considered quite repellent by both rabbit and deer.